For decades, companies have implemented weight loss programs as part of their employee wellness initiatives. On the surface, the logic makes sense. Obesity is a cause of common chronic conditions (e.g., heart disease, stroke, type 2 diabetes, and various forms of cancer) that increase healthcare costs and lower productivity. However, weight loss programs in practice are deeply flawed. As argued through an analysis of Biggest Loser participants, weight loss programs tend to promote intensive weight loss, which dramatically slows down one’s metabolism to the point that they do not burn enough calories to maintain their thinner size. As a result, most weight loss programs result in participants gaining back the weight (or even more weight), leaving participants feeling dejected and in potentially worse health. One argument for rapid weight loss has been that, assuming participants can keep the weight off, individuals experience greater initial health gains than an equivalent amount of weight lost over a longer period of time. Although this may be true, it does not tell the full story, and support for rapid weight loss is being challenged by a recent study in the Journal of Obesity. According to the study, people who lose weight rapidly do have better initial overall health outcomes; however, the net gains do not last as individuals who lose weight slowly eventually catch up to people who lose weight fast, evening out each strategy's benefits. When taking into consideration the impact on metabolic health and the risk for gallstones with faster weight loss, a slow and steady (one to two pounds per week) approach to weight loss makes sense. This is why Wellable does not and employers should not offer weight loss programs over a short period of time. These types of programs do not result in the desired outcome for employee wellness programs (healthier, happier, and more productive employees) and potentially create risks for employees. 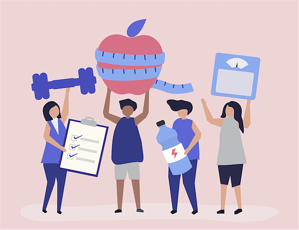 Instead of focusing on weight loss, employers should focus on healthy behaviors, such as physical activity, nutrition, sleep, stress management, and more. If employees engage in these behaviors, they will gravitate toward their appropriate weight, which may not mean weight loss, and employees will reap the benefits of a healthy workforce.